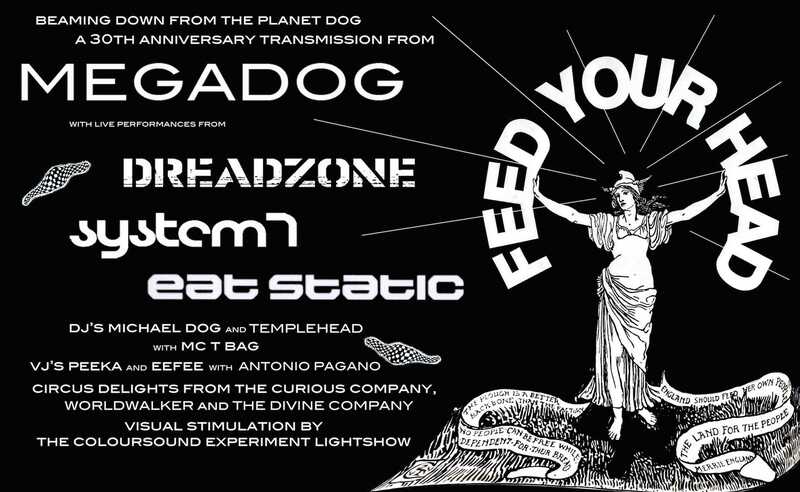 MEGADOG CELEBRATED IT'S 30th ANNIVERSARY ON NOVEMBER 21st, 2015. The Megadog organistation staged it's first event since 2001 to celebrate the passing of 30 years since a group of friends had the idea to run a regular club night at an obscure venue in North London which became known as Club Dog. 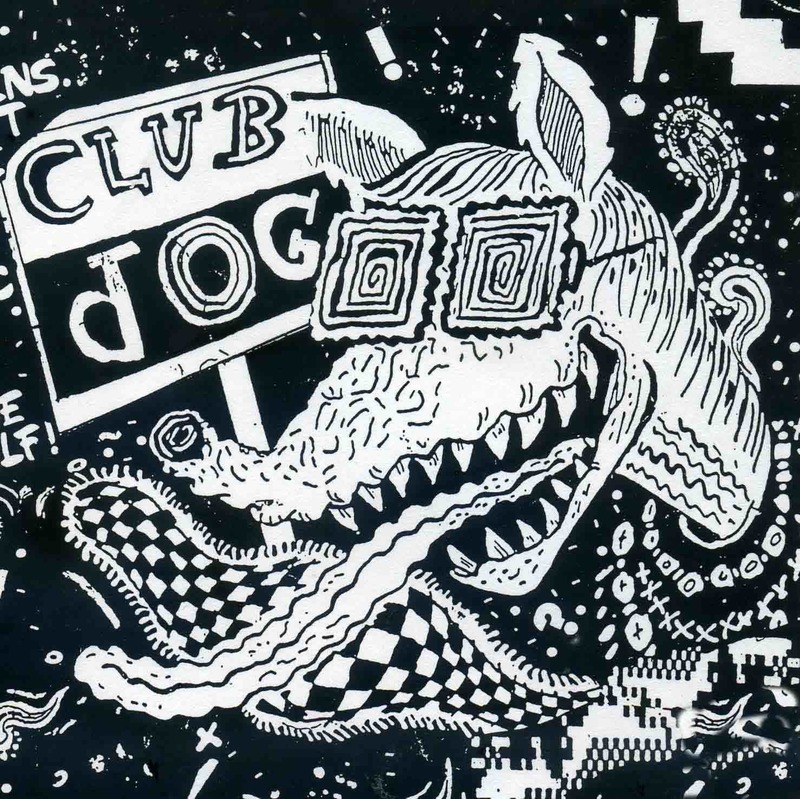 Club Dog ran as a weekly multimedia event featuring a miriad of live acts, performance artists, films, projections and DJ's for 7 years from 1985 before mutating between 1991 and 1993 into the travelling psychedelic dance music extravaganza Megadog. The legendary live electronica, dance music and performance event toured to venues all over the UK and Europe throughout the 1990's hosting performances by many of the era's key electronic music innovators and coming to roost every month at residencies at The Rocket in North London and the Manchester Academy. 2500 people made it to the sell-out 30th anniversary show at the Manchester Academy on November 21st, 2015 for a night of live performances from past Megadog stalwarts Dreadzone, Eat Static and System 7, classic sets from Megadog's original DJ's Michael Dog and Templehead along with MC T Bag, circus performance from The Curious Company, Worldwalker and The Divine Company, eye-popping lighting design by The Coloursound Experiment and video projections by VJ's Peeka, Eefee and Antonio Pagano. A big thank you to everyone who was there for bringing such positive energy and to everyone who ever came to a Club Dog or Megadog event over the years....we couldn't and wouldn't have done it without you! Megadog forum on Facebook, the best place to find discussions and photos about Club Dog and Megadog. Article on the early years of Club Dog, Megadog and Planet Dog Records by music journalist Andy Fyfe. Head Duster's cassette album archive including sets by various bands recorded live at Club Dog. Michael Dog archived DJ sets, radio shows and mixes on Mixcloud. Lots more mixes on DJ Templehead's Soundcloud page here. Home of The Coloursound Experiment, Megadog's original lighting designers. Home of The Curious Company, Megadog's visual performance coordinators. Promo video for the 30th anniversary show. Lights in a Fat City live at Club Dog, London 1990. Timeshard live at Megadog, Brixton Academy, London 1995. Timeshard live at the Megadog tent, Phoenix Festival circa 1995. The Oroonies live at Club Dog, London circa 1989. Treatment live at The Mad Dog's Tea Party, Shoreditch Town Hall, London 1991. 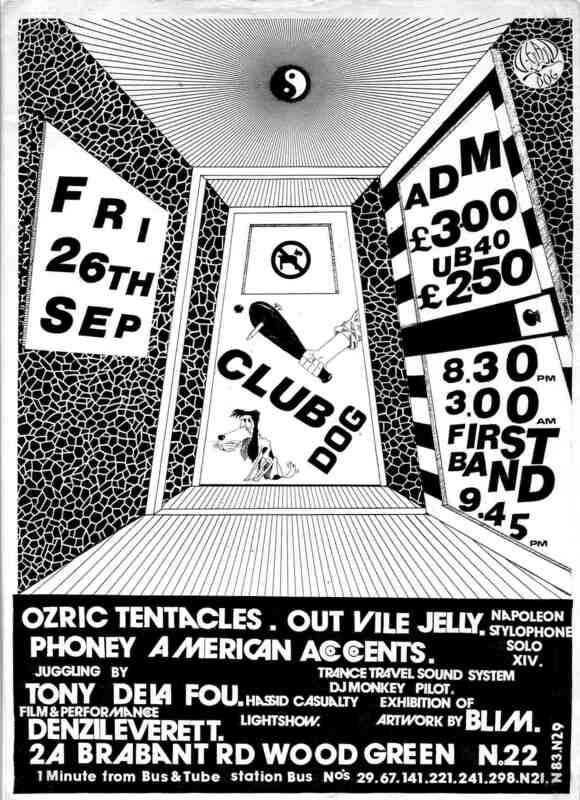 A short Club Dog promo from 'O1 For London' circa 1990. Ozric Tentacles soundcheck at The Mad Dog's Tea Party, Shoreditch Town Hall, London 1991. Megadog's 10th birthday party from 'The Beat' 1995. Megadog's 10th birthday party from 'BPM' 1995. Banco de Gaia live at Megadog, Brixton Academy, London 1995. Eat Static live at Megadog, Brixton Academy, London 1995. Children of the Bong live at Megadog, The Junction, Cambridge 1995. Nukli live in the 'Poodle Lounge' at Club Dog, London circa 1987/88. with MC TBag and DJ's Michael Dog (before) and Charlie Hall (after). Treatment live at Club Dog's 'Mad Dog's Tea Party', Shoreditch Town Hall, London. March 1991.